First, this year we are trying something different. It's important for students, faculty and interested parties to keep up with our decision making. While the Chase Diary, annotated and linked to pictures, is important, and will still be created, eventually, we will be trying a new way of keeping people posted. A daily, perhaps real time, blog. This is running as an experiment this year. We'll see how easy it is to accomplish the updating. But the blog will also have links to real time pictures, picture albums and weather maps, as appropriate. The mission is to (a) document tornadic thunderstorms; (b) document supercell thunderstorms in general; and (c) get lightning shots. The first two are very rare to relatively rare. Perhaps 1 in every thousand thunderstorms worldwide is a supercell, and of all supercells, less than 15% produce mesocyclone-tornadoes ("Wizard of Oz" type tornadoes). The first two depend on some aspects of the large scale weather pattern that mostly involve the evolution of the wind patterns at jet stream levels and the presence of low level moisture/instability. 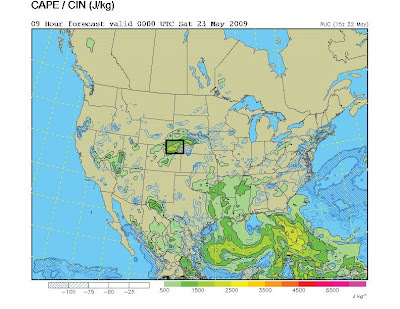 The Great Plains is climatologically favored for the juxtaposition of favorable low, mid and upper level patterns favorable for tornadic supercells, on average, the last two weeks of May and the first two weeks of June. Since I am a synoptic meteorologist interested in weather pattern analysis and forecasting, the chief purpose I have is to understand how the ingredients that produce tornadic supercells and supercells in general come together in the weather patterns that occur during the period of our chase. The challenge for me as a meteorologist is to forecast these patterns in advance and to put myself and my chase partner in a position to view a tornado and/or a supercell. Clearly, if we manage to do that, I have made a successful forecast. This is important because there are indeed weather patterns that occur in California that produce tornadic supercell thunderstorms. While these patterns are relatively infrequent, they do occur. In order to hone my skills in anticipating these patterns, though, I need to put myself in an environment in which forecasting "tries" at anticipating them occur frequently. Hence, these trips to the Great Plains. The results of these trips are measurable in the form of publications on tornadic storms in the Great Plains and in California. Also important, is the transfer of the knowledge I acquire into the classes I teach, particularly, Meteorology 302 (The Violent Atmosphere and Ocean, Meteorology 503 (Weather Analysis and Forecasting II), and, most significantly, Meteorology 515/815 (Analysis and Prediction of Severe Storms). We are in Denver, and plan to overnight in Boulder. The latest run of the medium range models still suggest that both deep layer and low level shear will be adequate for severe storms/supercells during the Tuesday-Thursday period in the region about 150 miles radius from Rapid City, South Dakota. The largest issue remains the circulation in the Gulf of Mexico, which is taking Gulf air southeastward into a developing tropical system. Nevertheless, either locally produced, or imported moisture does make it northward through the Tuesday-Thursday period. I have posted the dew point field forecast for Wednesday afternoon. It does represent the most robust dew point field of the week, and it does suggest some hope for storms, possibly supercells, in the region of favorable shear. Dew points would need to be higher in order for LCLs to be low enough to get tornadic storms, however, even if the dew point field verifies. The WRF-NAM is now in range of the early period, and still corroborates that there might be just enough low level moisture for storms to develop in an environment with a looped hodograph, albeit short (~35 knots of shear) over northern third of Nebraska, eastern Wyoming, and southern South Dakota on Tuesday (19th), with similar to better conditions the next two days. So this appears to be our last "relax" day. (Last night we saw the movie "Angels and Demons.") Then the surface pattern slowly evolves southward, with slightly better dew points as air comes around the horn, and the pressure pattern redistributes higher dew points over the southeast, leading to non-tranditional trajectories. So by Thursday or Friday we will be in north central KS or southwest Nebraska. By the way, I have had complete agreement with whomever has been writing the 4-8 Day thunderstorm outlook for SPC, who also has highlighted the fact that the pattern could generate severe/rotating thunderstorms in the Tuesday-Thursday period. One of those forecasters also mentioned high based supercells, but all concluded the overall risk is too small to include in a 30% outlook at this time. That's exactly the way we feel. We may be looking at blue sky, but we also might have rotating storms. The basic prognosis remains the same. The wind profiles look marginal to good for the region initially just north of Rapid City, SD (Tuesday), the Nebraska Panhandle into SW SD (Wednesday) and nw KS to sw Nebraska (Thursday). However, the moisture profiles look poor to marginal initially, to marginal by Thursday. Dew points are expected in the 50s to upper 50s in this region (see graphic for Tuesday). So, we are on our way north to Rapid City, SD today. With the shear profiles during the period, isolated storms are liable to rotate briefly before being enswirled by their own precipitation plumes. But, at least there is a risk for rotating storms. Here are some shots of Mt. 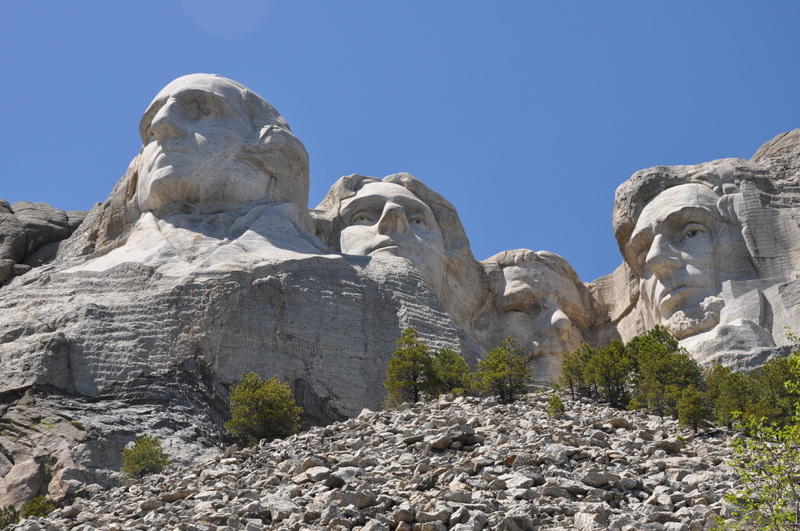 Rushmore, taken on our down day of May 19. Here's a panorama of the entrance area. 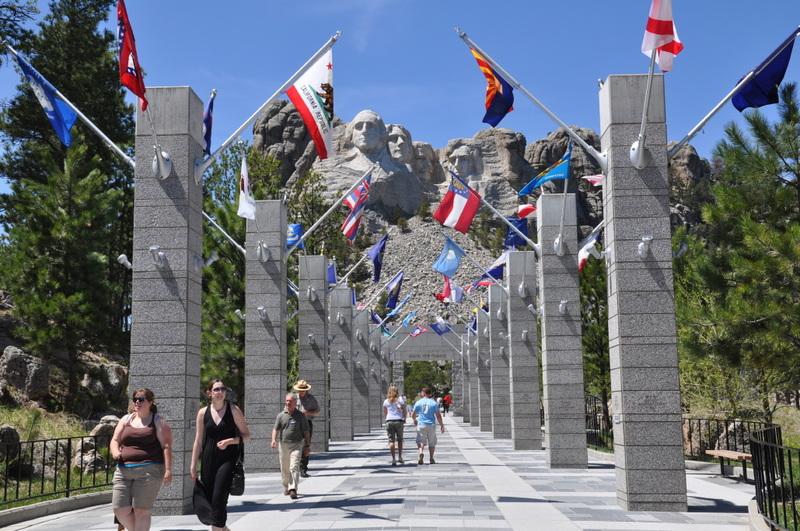 As you walk through that portal, the espalanade of the states frames the sculpture perfectly. 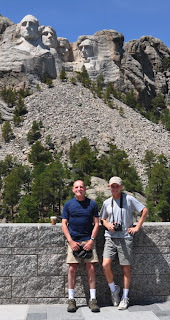 We walked on the President's trail to closer views. 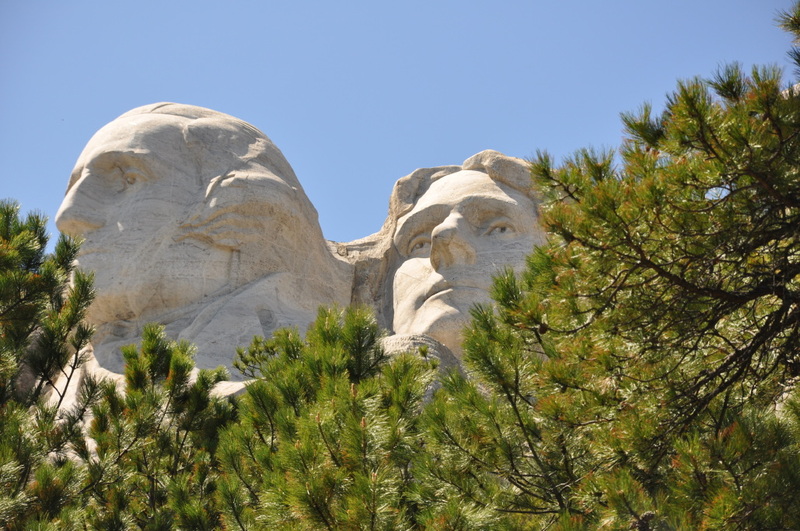 There are opportunities for some interesting shots, appearing as if the presidents are looming over the trees. I'll post more when I get time. The morning surface analysis still has meager dew points heading northwestward to the region just along and south of the South Dakota/Nebraska border for this afternoon. The WRF-NAM has shrunk the CAPE area even more but still has a knife edge narrow area of 1500 J/kg along and just south of the boundary that should stop its progression as a mesolow tries to form in Colorado this afternoon. 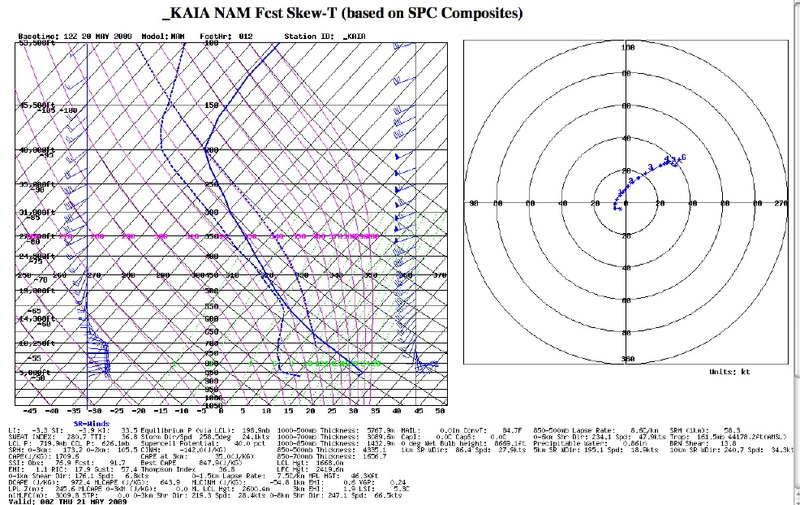 I plotted a few forecast soundings between Chadron and Valentine. Wow....60 knots of 0-1 km shear (because of the strong surface easterly flow combined with 40 knots of 500 mb flow. Low level shear is more than adequate, with forecast storm relative helicities favorable for moderate mid level mesocyclones. The issue will be dew point depressions again. Post frontal upslope flow along and just south of the South Dakota border should bring some marginal dew points into that area this afternoon. 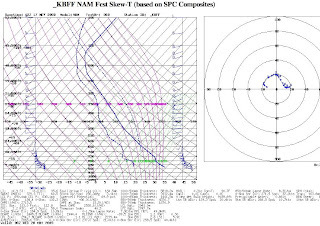 The environment is developing a shear profile very favorable for supercells in that area too. The large dew point depressions are liable to produce high lifting condensation levels, though, and the storms are likely to have high bases. There is a tug of war between the RUC and the WRF models today, with the WRF having higher dew points spread over a larger areas,and moderate to high values of CAPE (see forecast Valentine sounding). Right now it appears that we will see an LP supercell today...but there is always the hope of a "mesoscale" accident producing a supercell tornado, as Thom and I saw near Miami, TX in 1994. Non-supercell tornadoes are very possible today, and we'll take one of those. 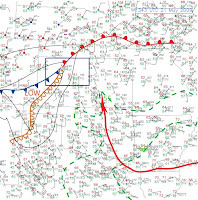 Storms began developing in the early afternoon in the Nebraska Panhandle and eastern Wyoming in the easterly flow that developed north of a southward sagging boundary. One storm became strong, and had some signs of rotation. The CAPE field pretty much verified as the RUC had depicted...so the storms were struggling. Yet, the shear was very strong. As a result, the updrafts did rotate, and the storms did qualify as supercells (a storm characterized by a rotating updraft, through 1/3 of its depth, and persisting for 15 minutes or more). Here are some pictures that illustrate the high bases, and the wrapping rain curtains. The first three were taken near Hyannis, Nebraska. The last shot, at sunset, was in Ogallala, Nebraska, as a high based supercelll drifted to the north of the town. Today's pattern suggests a bit of a focus for rotating storms in northwest KS today, but the "ifs" are really problematic. The mid-tropospheric winds have weakened, but the surface easterly flow should yield reasonable vertical shear values....however, not quite phased with the highest dew points (about 30 miles out of phase). Nevertheless, we are here to chase potential storms, so we will shortly drop south from Ogalalla, Nebraska into that area. Yesterday, the marginal moisture at lowest levels had the effect we expected. 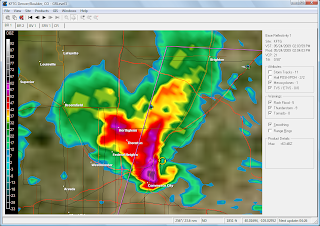 We did indeed get rotating storms....two supercells that we witnessed, albeit with high bases. The cloud base rotation was quite evident in the swirls where theupdraft was centered. We also saw VORTEX2's armada....over 40 vehicles...quite impressive. Very sluggish flow in the midlevels today....but if the 20 knots of southwesterly flow at 500 mb verifies, surmounting 15 knots of southeasterly flow, there are adequate dewpoints and moderate CAPE in northeast Colorado and southern Nebraska Panhandle today. Adequate for briefly rotating thunderstorms. ...of course, there has to be thunderstorm initiation, which did NOT occur yesterday. We overnighted in Garden City, KS, and we both got good workouts in....Thom running 10 miles on a bike trail here, and me 4 miles or so, plus a good long weight workout at the YMCA. It is now 11:30AM and we are now about to depart. Thunderstorms are likely to occur over this region (as they have occurred the last few days) over the next weeks or so, but projected shear patterns do not indicate that they will be tornadic. Hence, many chasers are making the decision to abandon their quests this year...the mission is not to find thunderstorms (which is an easy thing to do) but to find rotating thunderstorms (which is a much more challenging proposition). A Denver Convergence Zone developed in the late afternoon. 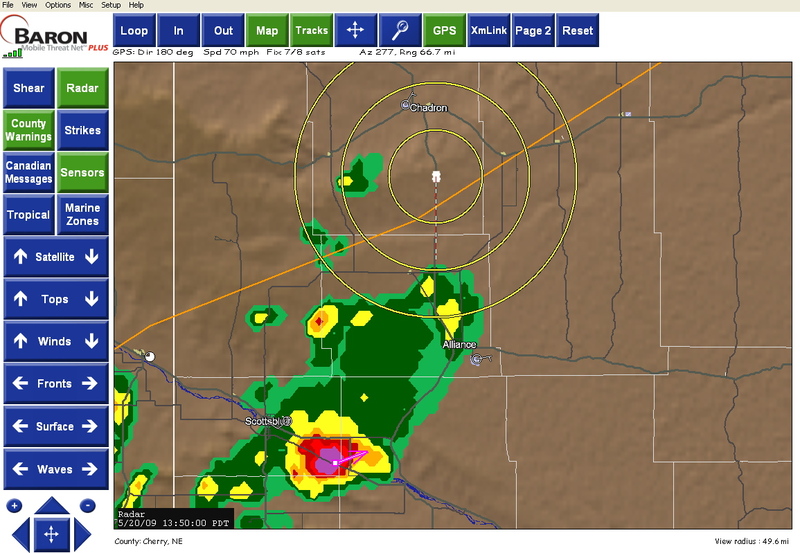 This took the high dew point air previously described in a counterclockwise spiral around Denver International Airport, with some strong storms developing. We were hoping for a non-supercell tornado (very common with this type of pattern) but, alas, although we had some fun chasing a strong storm (see right) near Akron, the whole area eventually erupted in moderate and heavy rain. 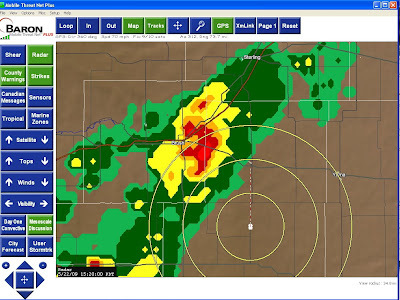 The picture was shot from the location, basically, shown on the radar plot. The yellow circles indicate our GPS position. The morning's surface weather maps shows, basically, a reprise of yesterday's pattern. A subsynoptic low is centered northeast of Denver, and, for this portion of the Plains, a rich supply of moisture is evident (basically, dew points in the mid 50s at 4000-5000 feet corresponds to dewpoints in the low 60s at sea level). For Thom's last "chase" day, we will be playing the Palmer Divide, east of Denver. This is the sort of pattern in which strong, early updrafts can spawn a non-supercell tornado (called, popularly, "landspouts"). Here's a picture of the two of us at Mt. Rushmore. This has been an uneventful trip so far (and likely to end so for me too). However, our frustration is tempered by the successful trips we had in 2004 and earlier years. This year's pattern is particularly frustrating for the participants of the VORTEX2 experiment. 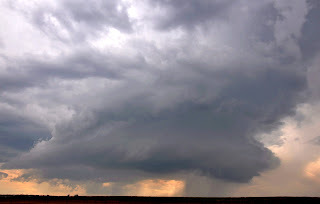 This huge operation, involving over 40 vehicles stationed at three locations over the Great Plains, and deployed to observe the microscale meteorology around tornadic storms, has been deployed exactly once since the operation started on May 10. That was this past Tuesday, when we saw a few supercells in the Nebraska Panhandle. However, these were not close to being tornadic. Well, on Thom's last day, we actually had a traditional chase. We dropped down to the Palmer Divide by early afternoon. There seemed to be a boundary with ESE flow south of the Divide and northwesterly or northeasterly winds north of the divide. Low to mid 50 dewpoints abounded. When we got to Limon, a strong set of echoes was between Colorado Springs and Limon. Just after our arrival there, the northern most of the echoes developed a rain free base, and then, somewhat to my amazement, a fairly good looking wall cloud. We dropped south and noticed that at least at the base of the wall cloud there was decent, but not strong, cyclonic motion. 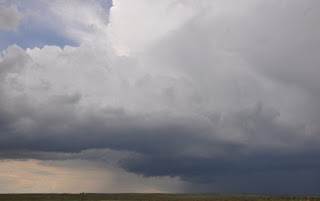 As the storm moved over us, the wall cloud became outflowish, but left behind on its eastern periphery was the high based funnel, nearly tilted horizontally. All in all, this was a very satisfying chase day. We salvaged an actual chase out of this wreck of a pattern. It also goes to show that what meteorologists call "mesoscale"accidents can produce bounty. A "mesoscale accident" is something that cannot be assessed by looking at computerized weather forecasts, but changes conditions favorable to those for rotating storms by some local effects that are difficult to assess, if not impossible (topography, boundaries from neighboring thunderstorms etc.) True, we did not see a tornado. But others reported brief tornadoes. Our high-based funnel is consistent with those reports. ...New Mexico, that is. Which is where Scott Landolt and I are overnighting. We left Thom off at Denver Airport but decided to stay in the area. A Denver Convergence Zone was developing again, basically a reprise of yesterday. And, this decision paid off for us all. It turns out that we ended up chasing right to Denver Airport. Thom's flight was in the late afternoon, so while we were chasing and he was waiting, a supercell developed west of Denver Airport. The radar development was spectacular, and the storm ended up producing a marvelously wrapped wedding cake, corkscrew updraft area. Yes, Thom was in the Airport when the tornado warning was issued, the sirens wailed, the klaxons sounded, and all were asked to the tornado shelters and planes were vectored off. We are not sure if the storm produced a tornado. 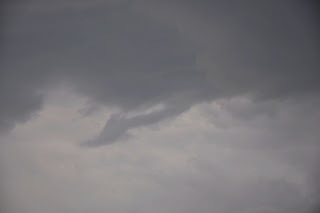 We did see two funnel clouds with earlier storms, and Cameron Redwine reported a funnel at the time of maximum development. I'll post more when I get my pictures downloaded. Our initial plan is to hope that the dry line does not set up too far east today. But, even if it is in southeastern New Mexico, where the shear environment appears somewhat favorable for a rotating storm or two, the moisture return from the Gulf is still meager. There is still a disjoint between where the greatest buoyancy is and the best shear. This has been showing up in the last few runs of the models. We'll reevaluate as we travel. 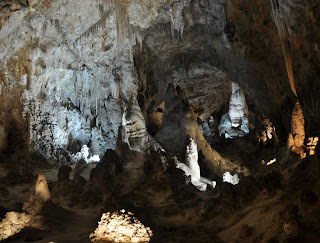 Meanwhile, we are planning to see Carlsbad Caverns...the bat flight tonight, and the caverns themselves tomorrow morning before all the tourists overun it. Here's another picture of the fabulous rotating storm we witnessed yesterday. Last night Scott and I witnessed the bat flight from Carlsbad Caverns. Because of the dry conditions locally the usual number of bats had not been making this flight; there were not enough insects for them to forage. The previous night the rangers told us only 10 bats had come out. The usual size for the colony is 400,000 bats. 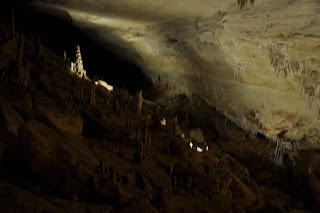 When Thom and my nephew Bruce and I saw this event in the early 2000s, it was an awesome vortex of black rushing out of the natural opening of the cave. Well, fortunately, last night a respectable bat flight did occur. Though smaller in size than I remember it, the flight still probably had 100,000 bats or so exiting over 15 minutes. 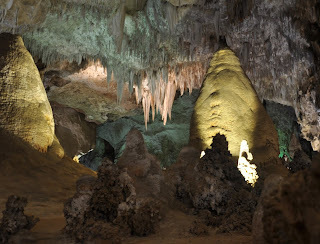 Today, we are leaving early to descent into the caverns for the two to three hour walk (goes about three miles). This will be my sixth time through, and I have yet to tire of this spectacular descent into a wonderland of colors, shapes, and spaces. I learned a valuable lesson the last few days of my trip (I am sitting here at DIA waiting for my plane as I type this). I realize that most severe storm researchers here are looking ahead to a possible pattern shift, and what's happened in Colorado the last few days may not seem important. But that Commerce City storm three days ago, and the storm southwest of Limon were eye openers for me. Those were not "landspout" storms (in the sense of a non-supercell thunderstorm just spinning up vorticity of the boundary layer). These were storms that formed initially in an environment that should not have supported supercells in the sense of the deep layer shear. Yes, yes, we are all used to pontificating about storm motions off the hodgraph and how you can get supercells in otherwise unfavorable environments. We all use the term "mesoscale accidents" to refer to storms that become supercellular out here without the obvious shear signatures in the morning's hodographs and wind profiles. But even though I know that, and all severe storms researchers know that, I doubt anyone chasing Colorado those the Denver Convergence and Vorticity Zone (DCVZ) days over the weekend were thinking "...oh, I really think some mesoscale accidents will happen and, forget single cells spinning up a spout, we are really going to see some good structure..." Maybe someone did. I didn't. All that I know who were out here were looking for landspouts, no more, no less. Frankly, those two days felt like "chase" days to me in the traditional sense. Thom and Scott and I were chasing supercells, with the updrafts in the correct locations with respect to the forward flank, with RFDs, etc. You know what, those two days allow me to leave the Plains feeling as if this trip was somewhat successful. Scott and I may write up something on the DIA storm on 24 May because of this. But there's something odd about this pattern that we are in. Perhaps it relates to global warming, perhaps not. I think the consensus from the linked ocean-atmosphere models used to project climate trends into the late 21st century show that most of the "warming" will take place in the upper middle and polar latitudes. If that's the case, the meridional temperature gradient will decrease a bit at the same time that the mean temperatures of the whole shabang go up. Decreasing the pole-equator temperature gradient USUALLY means higher wave numbers (more long wave meanders). This suggests that whatever controls external to the atmosphere are at play (say SST patterns) might act to anchor these meanders. Suppose one "anchor" was a trough on the West Coast....that had a response a ridge over the Plains downstream. Then we'd have a season or a period like the one we've just experienced. Suppose another time the anchor was in a different location, so that a mean trough sets up over the Rockies. That's what I meant really. I am not trying to relate mean temperatures to lapse rates or anything like that. All other things being equal, the latter would result in a "synoptically-evident" pattern for severe weather in the Plains. And that could go on for weeks, or even months. As far as lapse rates go, if the heating is equally distributed through the troposphere's depth, then the environmental lapse rate won't change much. However, the higher mixing ratios mean that when storms do go they would go with more CAPE. Hence, maybe not more storms, but storms, when they occur, that would be more violent. Who knows about how the lapse rates will really be affected, though. There is much to ponder here for severe storms meteorologists and climate change atmospheric scientists.